Until the late 1980s, there were very few democratically elected governments in the developing world. These areas were characterized by a range of authoritarian regimes from military administrations to one-party dictatorships. Over the past decade, however, the situation has altered significantly and an increasing number of developing countries have made the transition to democracy. For some, this process of building and consolidating democracy has been relatively easy, while for others, it has proved more complex and harder to sustain. In this important new textbook, Jeff Haynes seeks to explain why these differences occur. Adopting a broadly comparative approach, he begins by examining the theories and practice of democratic transition and consolidation in the new democracies of Africa, Asia, Latin America and the Middle East. Haynes argues persuasively that a country's ability to consolidate democracy depends not only on the interaction of structural and agency factors, but also on a variety of specific domestic and international concerns which may help or hinder democratic progress. Using a wide range of case studies to illustrate his argument, Haynes provides an accessible and comprehensive analysis of the processes and problems of democratic consolidation in developing nations. 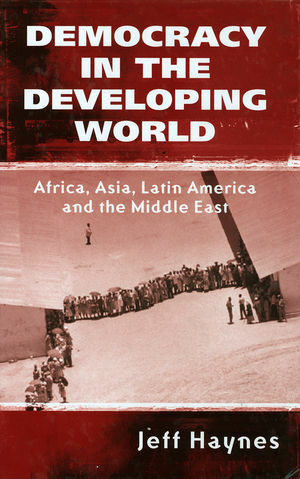 This is an important textbook that will be invaluable to students in a variety of areas from politics and comparative politics to development studies and history. Jeff Haynes is Professor of Politics at London Guildhall University. Chapter 1: The Third Wave of Democracy. The third wave of democracy and its ramifications. Chapter 2: Democratic Transitions and Structured Contingency. Democratic transitions in comparative perspective. Chapter 3: Explaining Democratic Consolidation. Democratic consolidation: political, economic and international dimensions. Theoretical perspectives and hypotheses on democratic consolidation. Structural impediments to democracy in Latin America. Democratic consolidation in Latin America. Case studies: Mexico and Venezuela. Chapter 5: East and South East Asia. Structural impediments to democracy in East and South East Asia. Democratic consolidation in East and South East Asia. Case studies: South Korea and the Philippines. Structural impediments to democracy in South Asia. Democratic consolidation in South Asia. Case studies: India and Pakistan. Structural impediments to democracy in Africa. Case studies: South Africa and Ghana. Chapter 8: The Middle East. Structural impediments to democracy in the Middle East. Democratization in the Middle East. Case studies: Kuwait and Turkey. Democratic consolidation in Africa, Asia, Latin America and the Middle East. Appendix: The Freedom House Survey and Organization.